To complete Zygarde in Pokemon Ultra Sun and Moon is a little easier compared to Pokemon Sun and Moon. 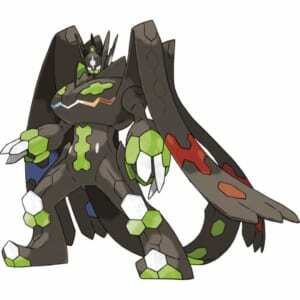 To create a Complete Zygarde, here are the steps. If you remember in the old Pokemon Sun and Moon, players needed to pick up items known as Zygarde Cells to complete Zygarde. However, in Pokemon Ultra Sun and Moon, the cells don’t seem to be as scattered as it used to in the previous game. In fact, capturing this legendary Pokemon is a lot easier now since majority of the cells are now bunched up together. The X-Y Legendary Pokemon is anti-meta Pokemon who can check past most common anti-Ground Type Pokemon. Having similar builds to Garchomp, the Pokemon’s main difference lies in its signature move: Thousand Arrows. When used after having performed Dragon Dance, Zygarde then becomes capable of sweeping through enemies. If given Dragonium Z, this Pokemon can also defeat other Pokemon that are strong against Ground Type attacks. Players first need to find the Cells to complete Zygarde. However, this happens only post-game. The first one to find is its 50% Forme is found in the Resolution Cave on Poni Island. This area is at the northwest end of Poni Meadow. Head then to the bottom of the cave where you’ll find the Pokemon waiting for you. After that, head to Route 16 and to the Aether Paradise Base. There, you’ll meet up with Dexio and Sina who will give you the 10% form of Zygarde plus a cube containing the remaining Cells. But only if you beat them in battle. After that, they’ll begin explaining how to complete Zygarde. With that, you can now choose what form the Pokemon will be to best benefit your team. Players can also choose to have the Complete Zygarde or the 50% form depending on their team composition.